Why choose our garden hose? Super-soft 3750D polyester fabric cover protects double latex inner tube, working normally under pressure of 4-8 bar (60-115 PSI) to prevent explosion, leakage, cracks and corrosion. HOW TO USE IT SO IT LASTS LONGER? Do not expose the hose to the sun for long periods of time. Do not leave the hose out in extreme winter weather. BRASS FITTING CONNECTOR WITH ON/OFF VALVE- The copper fittings have been considered the premium choice for durability and longevity of high pressure fitting. It perfectly solves the leak problems of plastic connectors, seldom crack or slip with solid 3/4" brass connectors and inner rubber washer. With the on/off valve on it, it's easy for you to shut the water without turning off the tap. The water quality of expandable with hydraulic hose growth to its original size 50 feet (water pressure and the total length and swelling volume effect) three times, but after water out, in a few seconds to return to the 17 feet! If you have any questions about this product by YEAHBEER, contact us by completing and submitting the form below. If you are looking for a specif part number, please include it with your message. 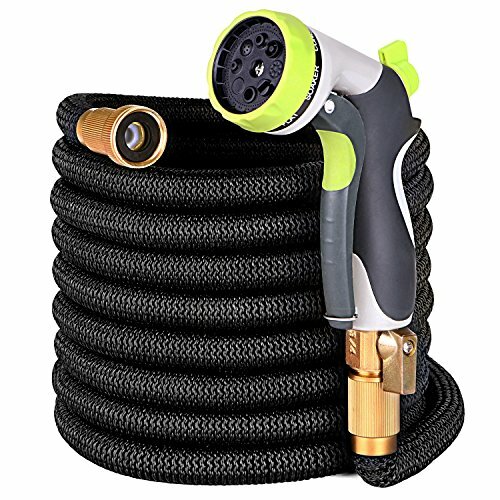 Melnor Flat Soaker Garden Hose; 50 ft.